Beautiful Apartment in the Heart of Krakow! Exclusive, and the largest of our apartments, Athena represents the highest standard- an apartment for demanding clients. Apartment Athena is a spacious apartment, consisting of a living room overlooked by a bright kitchen, bedroom, and beautiful bathroom. A wonderful aspect of the living room is the extremely comfortable, faux suede sofa-bed, as well as the 42 inch LCD television. Together, they ensure a restful evening, after an active day of touring lovely Krakow, or after a long day of work. Free wireless high-speed internet is also available. The living room is connected by a small bar-top with stools to the kitchen, which consists of the newest generation oven with electric stove-top, as well as a built-in refrigerator. The bedroom, designed to ensure a restful evening, consists of a large, comfortable bed with mattress of the highest quality; as well as thoughtful lighting. Apartment Athena will become your place in magic Krakow, to which you will always want to return. Location: Our location is ideal- close to the main town square, the train and bus stations, a shopping mall, the Kazimierz district, Wawel Castle, and the Wisla river. There are many shops (including grocery stores) and currency exchanges very close by also. We also have 3 other apartments in the same building- see our web page. I was born in the United States, to parents who emigrated from Poland. I fell in love with Poland, and Krakow most so. In addition, I have close family living in Krakow, and I travel there often. I chose Krakow because I fell in love with the city, and have close family there. There is so much to see and do, and the atmosphere is magical. From sightseeing; to museums; to skiing or mountainclimbing or hot springs nearby Zakopane, which is a day trip away; there is something for everyone. The location is perfect- close to the Main Square (with St. Mary's, the Cloth Hall, etc. ); still walking distance to Wawel Castle, Kazimierz, many other attractions. The bathroom, decorated in a beautiful brown pallette, is quite large, with a large and uniquely-designed shower. There is also a washing machine in the bathroom. 7 minute walk from the Main Square! There is also a washing machine which can be used by our clients (there is no clothes dryer, as most air dry). The living room and the bedroom floors are covered in beautiful African wood; the windows shaded by wooden shades. Together the color of the furniture, the wooden interior, and the unique lighting of the apartment ensure a warm feeling. 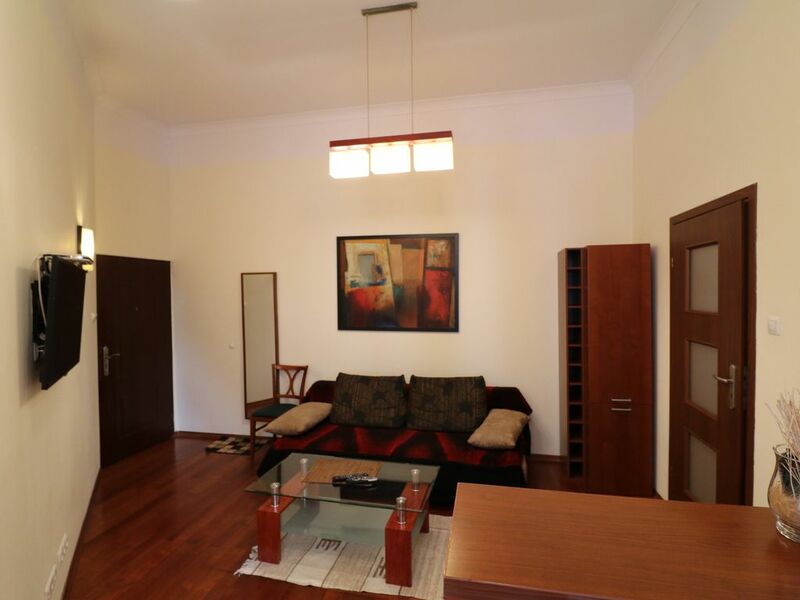 Great location: close to old town, the train station and shopping malls. The apartment is comfortable for 2 people and has all of the necessary amenities. There is no air conditioning but a fan at the apartment provided the necessary cooling. There are two TVs, one in the bedroom and one in the living room. The living room TV has a few English channels. The only issue I had was that the spin cycle on the washer did not work. However, the housekeeper, who speaks no English, was very helpful and showed me a second washer that I could use. Though I speak no Polish she always took the time to communicate in a way that I could understand without talking. I was met on time at the apartment at 8:30 in the evening and given all of the keys and shown the internet codes. I used the internet during my entire stay and was able to download Netflix movies to watch when I wanted. Overall I have a great time and would stay at this apartment again. Let me say this is a good place to stay. Great location. Comfortable bed. Friendly, helpful rental agents. But with just a little bit of tweaking, it could be perfect. 10cents worth of fabric softener would keep the towels from being terribly hard and the terry sheets from being too scratchy to sleep on. We had to use the second duvet over the sheets. Also the duvets are too small. I am 5'6" only and my ankles stuck out. There were 3 dead light bulbs and 2 flickering. The shower head needs to be replaced so it does not leak half the water away. And the stove is balky. It was great to have a washer. Wi-fi is too slow to open a picture or get into sites like Facebook very often. Someone needs to put the curtains back on the hooks. All of these things are annoyances easily fixed. If you are a light sleeper you will be bothered by street noise and the constant banging of doors. Like I said though, great location and comfy bed and the price is great. One word--there is NO coffeemaker. It is only a water heater and there really should be a toaster at the very least! It did not promise a toaster but I could not believe there wasn't one! Ideally located for old town centre and trams. Clean, comfortable accommodation would recommend. Just a short walk from the centre of the old town market square. The apartment is comfortable and cosy with everything you need for a stay in this brilliant city. This apartment was our home base for our 3 night stay in Krakow. It is in a great location that is within walking distance to the town center, the Wawal castle, and plenty of food and drinking establishments. There is also a small grocery store less than 1 block away. The flat was clean, spacious, and came complete with washing machine and wifi. If we come back to Krakow we will definitely consider staying at this flat again. Krakow (Cracow), Poland, Europe (In Downtown Krakow, Minutes by Foot from the Main Square) One of the many advantages of this apartment is its great location. It is situated just next to the main square, on the North side; and within close reach is the Wawel castle, the wonderfully-developing neighborhood of Kazimierz, as well as the main train station. Athena is located in a quiet building, inhabited mostly by foreign residents. Ski: Skiing is available near Zakopane during the winter season. The town is reachable best by bus (~2-3 hours ride), available at the bus station (~10 minute walk from the apartment).